All our contact lenses are supplied through our Eyeplan Contacts Aftercare Plan. Members of Eyeplan Contacts simply pay a fixed monthly fee by direct debit which includes all contact lenses, solutions and all eye care appointments. Contact lenses really can change your life! At Andrew Keirl Opticians in Liskeard it’s our job to find the best contact lenses to suit your lifestyle. Using the links on this page you will find a summary of lens types currently on the market. Soft daily disposable contact lenses, also referred to as “dailies” are an economical option for part-time contact lens wearers as well as those who want convenient, no-fuss daily contact lenses. 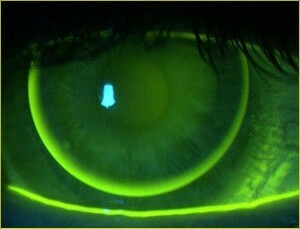 This type of contact lens is designed to be worn once and then thrown away. No solutions or cleaning is required. Soft daily disposable contact lenses are available to correct long sight, short sight and astigmatism. They are also available in bifocal form and in a range of lens materials including traditional hydrogel materials, biocompatible materials and silicone hydrogel materials. Soft daily disposable contact lenses are ideal for patients who only wear lenses occasionally. Certain soft monthly disposable contact lens can be worn overnight or for extended periods but the vast majority of lenses available are designed to be worn during the day. At the end of the wearing period they have to be removed from the eyes and require cleaning and storing on a nightly basis. This may sound daunting but it is really a simple process. Soft monthly disposable contact lenses are ideal for those who want a better value option to daily disposable lenses. Soft monthly disposable contact lenses are available to correct long sight, short sight and astigmatism. They are also available in bifocal form and in a wide range of lens materials including traditional hydrogel materials, biocompatible materials and silicone hydrogel materials. A gas permeable contact lens is a type of hard contact lens that was at one time very popular with opticians and patients. However, advances in soft lens designs and developments meant that this type of lens went out of fashion with opticians and optometrists in recent years. It is however making a bit of a comeback! Gas permeable lenses are excellent for use with high prescriptions and in particular for correcting high levels of astigmatism. In such cases gas permeable lenses will usually give better vision than soft lenses. They are also available in bifocal form again providing excellent vision at all distances. Like soft monthly disposable contact lenses they are not usually worn overnight and require cleaning and storing. A toric lens is the general term used to describe contact lenses that are specially designed to correct astigmatism. They are available in all of the soft contact lens options and also in gas permeable contact lens designs. Multifocal contact lenses are contact lenses that are used just like varifocal or bifocal spectacle lenses. They may be necessary when the effects of presbyopia results in problems focusing at intermediate and close distances. Most multifocal contact lenses work in a slightly different way to varifocal or bifocal spectacle lenses but the objective from the patient’s point of view is the same, clear vision at all distances. They are available in all of the soft contact lens options and also in gas permeable contact lens designs. Contact lens costs vary according to the complexity of prescription and are prescribed according to the clinical needs of the patient. The result is the best product on the market at all times. Contact Lens Patients at Andrew Keirl Opticians in Liskeard are encouraged to join our direct debit scheme known as EyePlan Contacts. Once you are registered as a member of Eyeplan Contacts, all of your routine aftercare, eye examination and any emergency appointments are covered. In addition, all contact lenses and solutions (if required) are included in the monthly fee. Members of EyePlan Contacts are automatically upgraded to our highest level of eye examination which includes digital retinal imaging. Eyeplan Contacts members enjoy a 25% discount on all spectacles and sunglasses along with free accidental damage cover for two years* on spectacles and sunglasses purchased from Andrew Keirl Opticians in Liskeard. *Subject to terms and conditions available from Andrew Keirl Opticians.